Warm Audio WA-412, 4-Channel Discrete Microphone Preamplifier and Instrument DI. The WA-412 provides 4 channels of classic American console preamps in a sleek 1RU design. This style of preamp is often referred to as "the sound of Rock n' Roll" for its BIG punchy low end and smooth open top end. The price/performance ratio of the WA-412 is almost unfathomable to the experienced studio engineer who has possibly paid much more for preamps of this style during their career. Featuring fully discrete socketed 6-pin opamps and custom wound Altran USA inputand output transformers, the WA-412 leaves nothing to be desired. If you are looking for multiple channels of world class tone in an affordable package, the WA-412 is the right choice for you. Hook-up Diagrams Inspiration behind the WA-412. When I first started holding regular studio sessions years ago I always desired to have more channels of high-end mic pre's. I could only afford to have one or two in my studio at a time, which was never enough to record a full band or drummer. "I knew very well that if signals were not recorded well "on the way inthey wouldn't be salvageable later, but my budget constrained me, so many of thesources were recorded through poor-quality mic pre's. If the WA-412 was available back then I likely wouldn't have had to settle for poor, low-quality tone. The WA-412 was designed "for the people" (if you will) and we believe it will become a serious work-horse in many professional and homestudios. Bryce Young (founder) More features. The WA-412 has all of the features one would expect from this style of preamp... Output Trim has been added to every channel for precise control and creative gain structuring. We also added a Tone switch (transformer input impedance) to each channel, which allows you to choose the warm and punchy classic console tone, or a more open & neutral sound. Each channel utilizes a fully discrete socketed 6-pin opamp that can be swapped with other opamps. Discrete opamp circuitry is known for its high headroom and low distortion characteristics and has much to do with the coveted sound of these classic console preamps. We worked closely with Altran to create unique transformers that extend the low frequency response of the design. The transformers also use a vintage winding technique that produces a very distinct smooth & open character. Carefully choosing the WA-412 components has resulted in an amazing four channel'workhorse' preamp/DI that performs at the highest levels, while still adding a touch of vintage console magic to your signal. 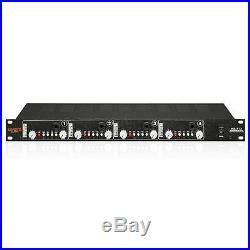 4 Channel Microphone Preamplifier + Instrument DI. Fully discrete, transformer coupled, through-hole component topology. Altran USA custom wound, premium input and output transformers. X520 discrete op-amp in every channel, socketed for convenience. Can be user-replaced with most 6 pin, discrete op-amps for varying flavor & tone. Output trim knob for precise level control and tone sculpting. 4x Microphone XLR & 4x Active Instrument 2Meg ohm HI-Z. 4x Transformer balanced XLR & 4x TRS. 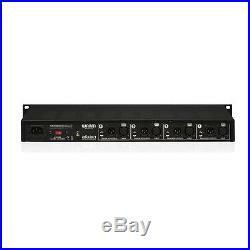 Input impedance switches from 600 ohms to 150 ohms (affects the tone of both the mic and HI-Z inputs). Pads both mic and instrument DI inputs. Internal (grounded, 3 pin IEC cord). For over 35 years we have been serving professionals as well as amateurs in the photographic, video, digital imaging and telescope fields. We offer the best combination of quality services, vast selection, knowledgeable staff, and competitive pricing. Adorama Camera is your #1 source for the best and newest products in the photographic industry, and the largest inventory of items such as Digital Cameras, Digital Camera Accessories, Memory Cards, 35mm Cameras, Medium Format Cameras, Lenses, Video Cameras, TV's, MP3 Players, Binoculars, Telescopes, Scanners, Inkjet, Dye-Sub & Laser Printers, Office Fax machines, Shredders, Projectors, Inkjet Paper, Photographic Accessories, Filters, Batteries, Cases, Tripods, Flashes, Lighting & Studio Equipment, Film, Darkroom Products and Audio Video Equipment. Selecting "Immediate Pay" is the way to go. In an effort to comply with our Authorized Dealer contracts with the manufacturers and to best control our inventory levels we reserve the right to limit quantities or cancel orders to Resellers and Exporters. Please note: Inventory is not reserved until the item is paid for. These charges must be borne by the recipient. Adorama has no control over these charges and cannot predict what they might be. No guarantees for emails in this matter. When your TV is delivered please inspect the TV for any obvious damage. A broken or damaged outer box is a first sign that your TV may have been damaged in transit. Open the box immediately and inspect your TV. Memory cards and any other Blister Pack items are not returnable once opened. Printers, Desktop Computers, Laptops, Tablets & Notebooks are not returnable once they are booted up or the toner is installed, as per the manufacturers contracts, all service to be done through them directly. The item "Warm Audio WA-412, 4-Channel Discrete Microphone Preamplifier and Instrument DI" is in sale since Saturday, January 07, 2017.